Powering the dreams of India’s next generation. 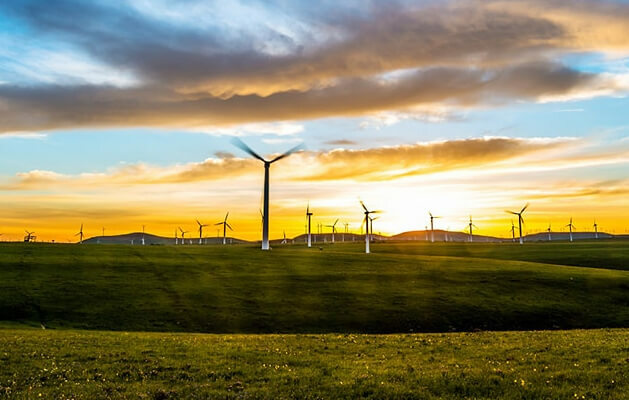 Wind power is the next-generation source of clean, renewable energy, and Mitsubishi Electric’s power semiconductors are the key to generating even more power from every breath of wind. Wind power is one of the leading ways to generate clean energy without greenhouse gases. Compared to other natural energy sources, wind power has a very high energy conversion rate and can generate electricity at low cost. 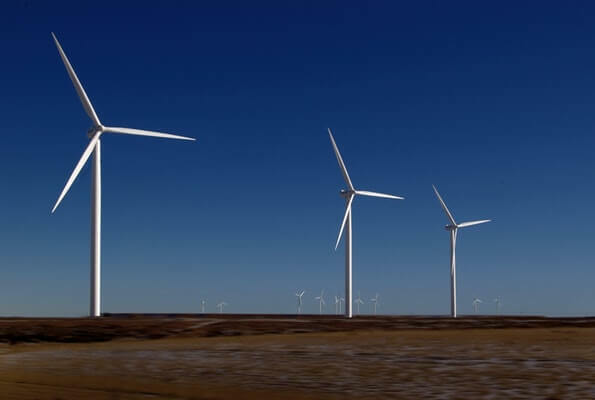 With its vast wind power resources, India is a perfect match for this technology. Already the fifth largest producer of wind energy in the world and growing, India has implemented tax incentives and feed-in tariffs for wind power, further accelerating investment and the construction of new wind power projects and attracting involvement by numerous world class wind power companies and related enterprises. It is no surprise that wind power is generating not only more power, but also excitement as one of India’s fastest growing industries. As long as the wind has blown, people have harnessed its energy to pump water, to mill grain, and now to generate electric power. 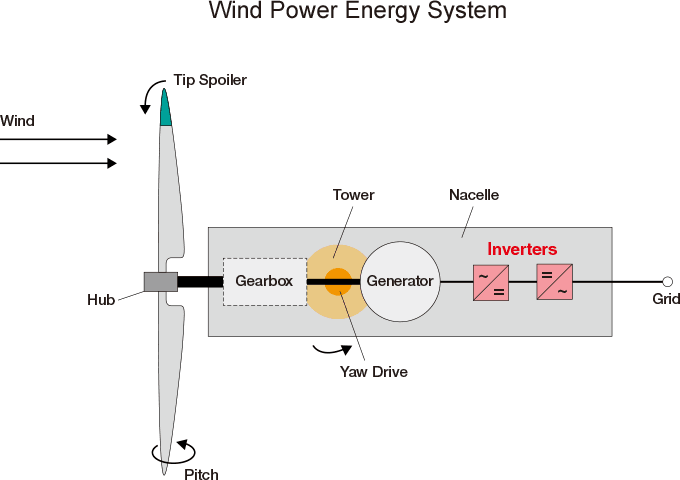 The principles of wind power generation are simple, but the technologies behind it are quite advanced. First, the pressure of the wind’s kinetic energy on the wind turbine blades causes them to rotate. The mechanical rotation is transmitted through the rotor axis to a gearbox that multiplies the rotational speed and turns the generator. The resulting electricity is then transmitted to the transformer in the tower, and fed to a substation. The challenge is the dependence of the wind turbine on the strength of the wind, which is never constant. The stronger the wind, the faster the turbine turns and the more power is generated, but if the wind weakens, power generation drops. In order to manage the fluctuating levels of electrical output, wind power generators are equipped with both an inverter and a converter. Mitsubishi Electric provides the power module which is the key device in the inverter. 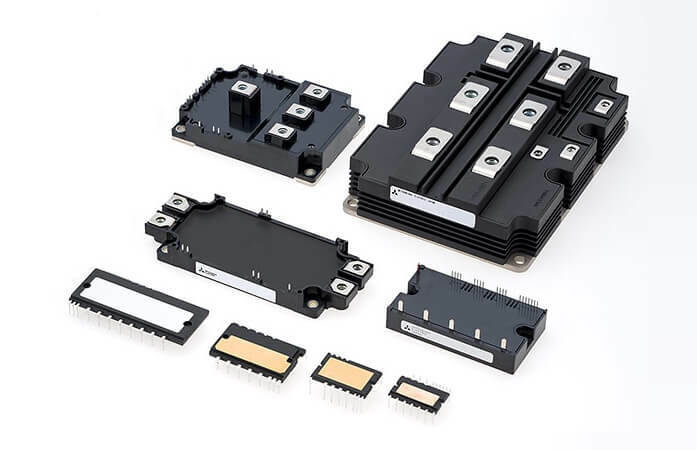 Power semiconductors are widely used not only in renewable energy systems such as wind and solar power, but also in everything from home appliances such as air conditioners to industrial applications such as rail transportation, elevators, and industrial equipment. For that reason, there are high expectations that advances in semiconductors will have a positive impact on the efficiency and performance of the many technologies that are paving the way to the low carbon society of the future. 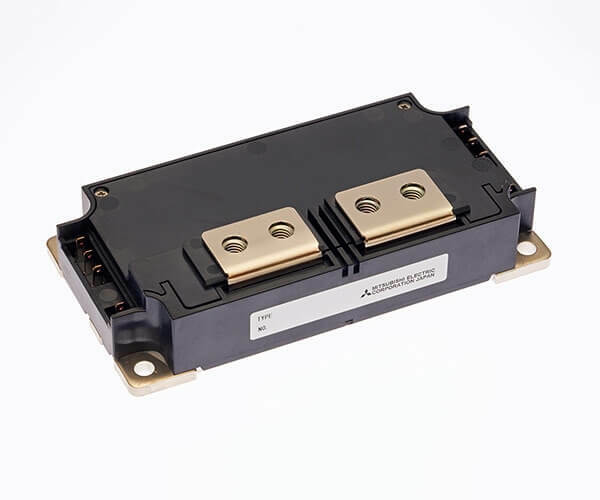 As a leading manufacturer of electrical and electronics products for home and industry, Mitsubishi Electric integrates our own power semiconductors in many of our products. We also develop and provide power semiconductors that must satisfy the diverse requirements of customers in a wide range of industries. 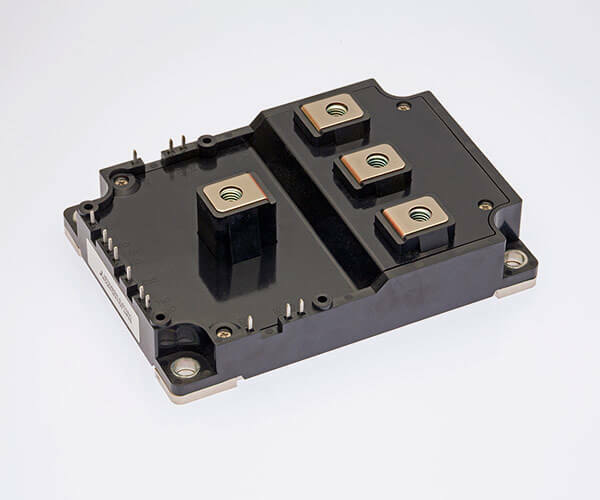 Through our synergistic development of solutions for these customers, we are constantly honing our power semiconductor technology to a cutting edge. The result is the unrivaled performance and reliability of our power semiconductors and Mitsubishi Electric’s top share in the global market. The potential wind resources for on shore wind, facing from the sea to the land, reaches 45,000 Mega watts per day. Meanwhile, more stable wind power generation is possible using offshore wind which is less affected by terrain and buildings. Some loss always occurs when electricity is generated or transmitted. The key to minimizing that loss is the power module. This device is tasked with both converting as much of the rotational energy of the massive wind turbine into electricity as possible, and then transmitting that electricity to the electrical grid with minimal loss. Through the development of highly advanced and compact power modules with low power consumption, Mitsubishi Electric contributes to not only lower power generation costs, but also improved energy conversion rates. Integrated in the inverter, the compact device eliminates the need to make the inverter larger to control the huge electrical current flowing through it. According to the European Wind Energy Association, wind power is expected to surpass both gas and coal to become the most used power generation method in Europe by 2030. With the recent announcement of the first offshore wind farm in India, wind power will play a central role in the electrical energy policy of this nation. Please contact us for business area you want to discuss.